-I assume that you already have an iso of Windows 7 Release Candidate. If you still dont have it, then you may make an account on microsoft.com and try to find the Release Candidate in there. You can also search for it in torrent sites if microsoft doesnt host the file anymore. Note: Before you begin, you must atleast have a 2gb memory installed on your motherboard. Because windows 7 has the recommended memory requirement of 2gb. I've already tried this one using only 1gb, but I have no luck. So I'll be saving this one until I can buy another 1gb of memory. 3. In Sun VirtualBox window, click on New button to launch the New Virtualization Machine Wizard. 4. 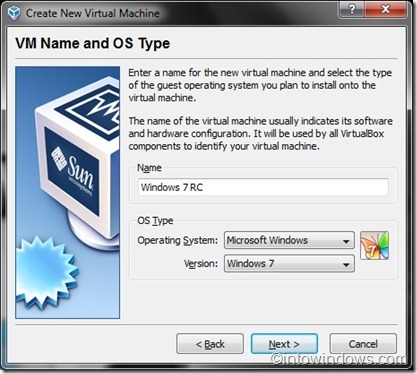 Click Next and enter a name for the new virtual machine, select the type of the operating system as Microsoft Windows, and select the version as Windows 7. Click Next to proceed further. 5. 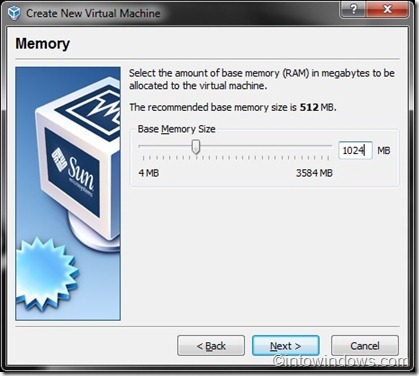 Here you need to allocate the memory to the new (Windows 7) virtual machine. Depending on the amount of RAM installed on your system, you need to select the memory size. Since Microsoft recommends minimum of 1GB RAM for Windows 7, enter 1024 MB in the right-side box. Again, click Next. 6. On the following screen, you need to create a new hard disk by selecting Create new hard disk option. 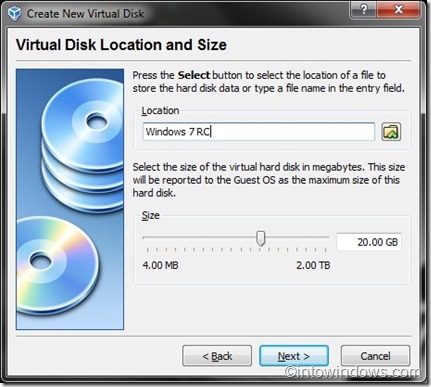 Clicking on Next button will open Create New Virtual Disk Wizard. Click Next. Select Dynamically expanding storage as this storage initially occupies a very small amount of space on your physical hard disk. It will grow dynamically (up to the size specified) as the Guest OS claims disk space. Alternatively, you can also select Fixed-size storage. As the name indicates, fixed size storage doesn’t grow. Once again, click Next button. 7. 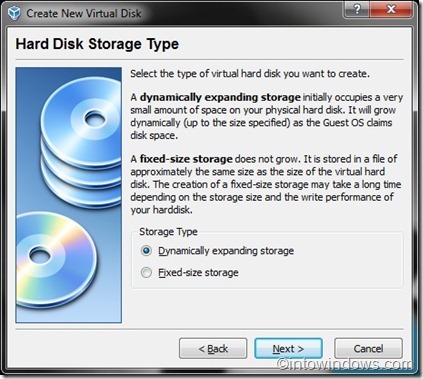 Select the size of the virtual hard disk. By default 20 GB is allocated. Since Microsoft recommends 16 GB of free disk space for 32-bit & 20 GB for 64-bit Windows 7, let’s use the default 20 GB as the virtual disk size. However, you can change it if you don’t have enough free space. But make sure that you have allocated 16+ GB. Click Next and then Finish to finish virtual disk setup. 8. To begin the next step, make sure that you have downloaded Windows 7 RC ISO. 9. 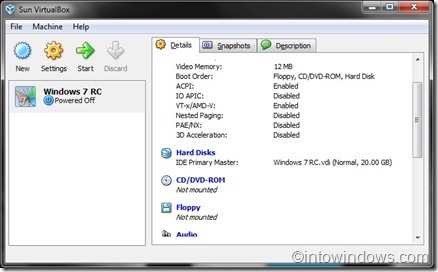 Select Windows 7 RC in the left pane, & click Settings to start configuring Windows 7 settings like RAM and disk space further. 10. 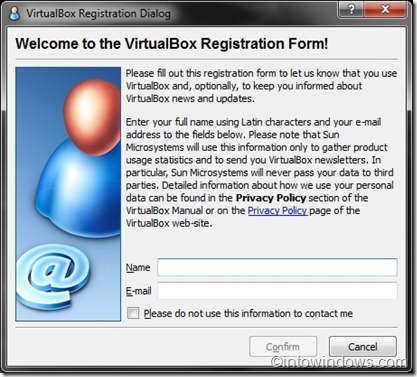 Click Start button to begin Windows 7 RC installation on Virtual Box. You will see a message about the host key. Just read it carefully and click ok to see the First Run Wizard. 11. Select the media you would like to use for installation purpose. 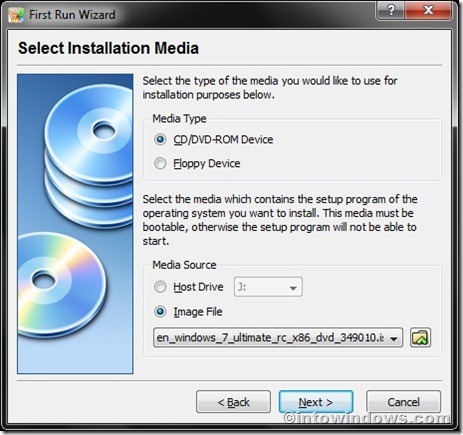 Select Image file option as media source as you are using Windows 7 ISO file to install. If you have Windows 7 DVD, select Host Drive letter as your DVD drive. Click Next and then finish to begin the installation procedure. 12. 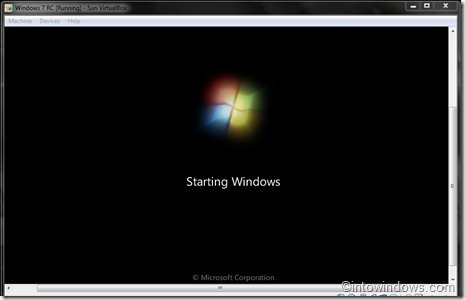 Windows 7 installation process will start in a few seconds. Just follow the onscreen instruction to finish the installation procedure.